Japan will launch a climate research satellite in December to analyze and forecast global warming-linked environmental changes, the science ministry said Friday, according to a news article in Kyodo News. The satellite, named Shikisai, will be placed in orbit 800 kilometers above the ground from where the satellite will conduct long-term monitoring of cloud cover, levels of dust and aerosols in the atmosphere as well as ocean color, vegetation, snow and ice cover on the earth's surface. The launch, planned for December 23, is intended to improve the accuracy of global warming forecasting and to help tackle associated problems, according to the Ministry of Education, Culture, Sports, Science and Technology. The Shikisai satellite will be carried by an H-2A rocket from the Tanegashima Space Center in southwestern Japan together with a low-altitude test satellite, which will travel in an orbit with an altitude lower than 300 kilometers according to the Japanese science ministry. 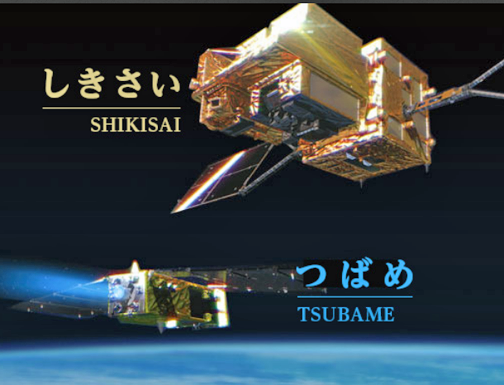 The Super Low Altitude Test Satellite, named Tsubame, is equipped with an ion engine that will be assessed for its ability to maintain speed and altitude in low orbit. The lower orbit has been undeveloped and is yet to be fully used by satellites, according to the Japan Aerospace Exploration Agency (JAXA). While traveling in a low orbit brings benefits such as the ability to capture high resolution observations for optical images, the Tsubame will be exposed to atmospheric drag approximately 1,000 times greater than that of most Earth Observation satellites at an altitude of 600 km to 800 km, the space agency added.